My time in Japan has been full of all sorts and one of the things I have enjoyed the most is sharing the stories of my journey so far through talks at schools and clubs. 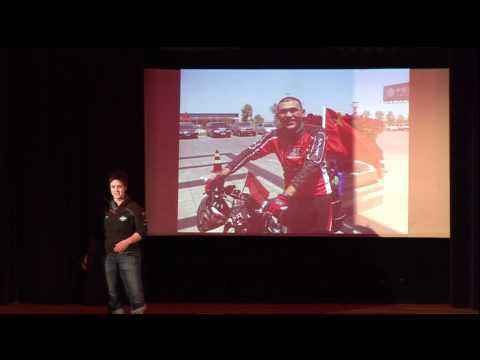 Here is a little video from a recent talk I gave at the first TEDxTokyoTeachers event. There are some wonderful speakers after me, so do dig about on the site and share all the great messages. I particularly loved this one by Miki Kano on teaching Japanese children critical thinking skills. Enjoy! PS Overhauled website going live soon…watch this space! Wow !!! that was soooooo inspirational. What a girl!!! ( I may be a bit biased , BUT that was such a powerful speech!!!!!!) I am so proud and Derek would be too. Big HUGS . I second your Mum’s comments and both your Mum and Dad will have been so proud of you, we are to. You certainly inspires us and many more folks. Not so long to wait now until your mUm arrives, have a wonderful time with her and your other visitors and we shall look forward to hearing about your travels and training etc ready for the big row. Take care and all good wishes. Big hug to your Mum as well as you. Hi Sarah. Very interesting philosophy on how to face and overcome obstacles. Also, I think it’s the taking part that counts. I’m going in for the Windhammer competition – writing gamebooks can be a headache, but both challenging and exciting! Whether I come first or last, at least my name is up there within internet archives. Gao was right: you have to attempt things or regret not having done so. Also, while failure is disappointing it adds valuable experience. It’s how we mature as people, helps us understand and support others who fail or struggle. I’ll be heading off to Scotland soon, doing voluntary work for the RSPB. great to hear from you sarah,good to see you insuch fine fettle for the next bit of the adventure,it really is inspiring that even people on the cutting edge of human endeavour can find icons and this chaps certainly embodies the spirit of adventure,it must be heartening to meet people like him as you move forward on your journey.gives everyone new belief in the human spirit!!!!!! I have been following your journey and have read your book but never commented on your blog. What a great clip. I was with John Garner at the weekend reminising on Duke of Edinburgh days and we were discussing your journey. Good Luck for the next chapter. I think it suits Gao’s spirit very much, ya? Gaaaooooo….